Its that time of the year again for our annual 2018 Halloween Pet Photo Contest. Submit a photo of your pet in costume onto our Facebook event page: Halloween Pet Photo Contest. All contest participants, friends, family and the general public will be invited to vote for their favorite pet to win across several categories. We encourage your friends and family to like your photo to boost your pet’s votes! • Voting runs until November 2, 2018 with the winners announced later that evening. Two Additional Winners will be selected as runners up. Please note: The winner of the contest must be up to date on all required vaccines. Call with any questions. 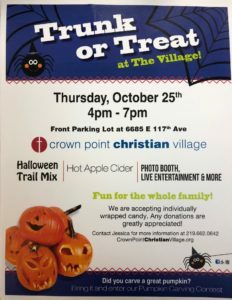 Come join us on October 25th at the Crown Point Christian Village for a night of Trunk or Treat from 4-7pm. Four Seasons Animal Hospital will be there along with many other organization and families enjoying the festivities -Halloween Trail Mix, Hot Apple Cider, Photo booth and live entertainment. Stop by and see us! We will be passing out candy for the kids and a special surprise for your pets!